This is a pattern puzzle that can be used for students in K-5. Included are two versions. The PreK-K Version has the outline of each pattern block used in the puzzle. The Gr1-2 Version only has the outline of the puzzle, which allows students to explore other shapes to complete the puzzle. Pattern block pieces and answer key is also included! 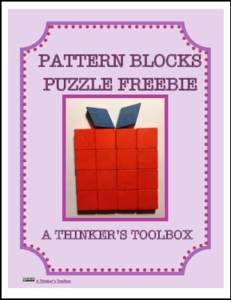 Pattern Blocks FREEBIE by A Thinker’s Toolbox is licensed under a Creative Commons Attribution-NonCommercial-NoDerivs 3.0 Unported License.